(NaturalNews) A lack of available hospital beds in Liberia, Sierra Leone and Guinea, the three countries at the epicenter of the worst Ebola outbreak in history, is leaving many families with nowhere to take their sick and dying. More than 80 percent of Ebola patients, in fact, are being turned away from hospitals and sent back home, where they continue to spread the disease to family members, friends and others in the community. A major shortage of beds and healthcare workers throughout the region has created an every-man-for-himself situation in which infected folks are having to basically fend for themselves. 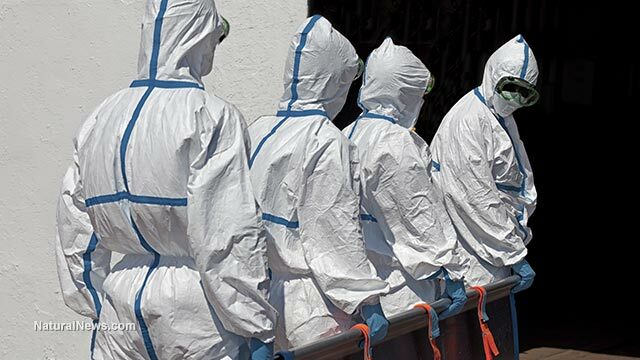 This is a worst-case scenario for containing the disease, as most of its spread is believed to occur when Ebola patients return home and try to hide their disease from everyone else, quietly spreading it in the process. The New York Times (NYT) says that only 18 percent of Ebola patients are receiving proper care in isolation from the general public. This leaves the other 82 percent to meander about, haphazardly infecting others who then infect more others, and on and on it goes with no end in sight. By January 20, say experts, as many as 1.4 million people could become infected with Ebola in West Africa due to this epidemic of non-containment. Adding to the dilemma is a growing lack of available health workers, many of whom are too fearful to enter the Ebola zone to offer care. At this point, the governments of the worst-hit countries are acting as body-collectors, going town to town to collect the dead, as prevention and containment is no longer an option. The family of one Ebola patient, who suffered major symptoms for six days prior to his death, was turned away from treatment centers twice, because they were already full. He is among the growing many who the government has had to come and haul away, a situation that the NYT describes as a "ballooning circle of contagion" caused by a lack of available resources. "We had to carry him home two times because they could do nothing for us," stated 25-year-old Eric Gweah, the man's son, to reporters. "The only thing the government can do is come for bodies. They are killing us." In the next few weeks, the U.S. government plans to deploy 3,000 military servicemen to West Africa to build 17 more Ebola treatment centers, which would another 1,700 beds to the mix. The mission will also reportedly include the training of 500 additional health workers per week, a lofty goal that some local aid workers see as unrealistic. Part of the problem is that, even if the centers are built in time to make a difference, there will be nobody to staff them. International aid workers are the region's only hope, but few are willing to risk contracting the disease by entering the hot zone. "I've worked in many crises for more than 20 years, and it's the first time I can see a situation that nobody wants to come," stated Jean-Pierre Veyrenche, head of the World Health Organization's (WHO) plans to build more treatment centers in West Africa. "There's plenty of money, so that's not the issue. People are afraid to come -- that's it."